Is the Future of Best Buy a New Generation of Electronics? Best Buy has been in financial trouble for the past few years. Sales have been declining and the company is now losing billions of dollars. 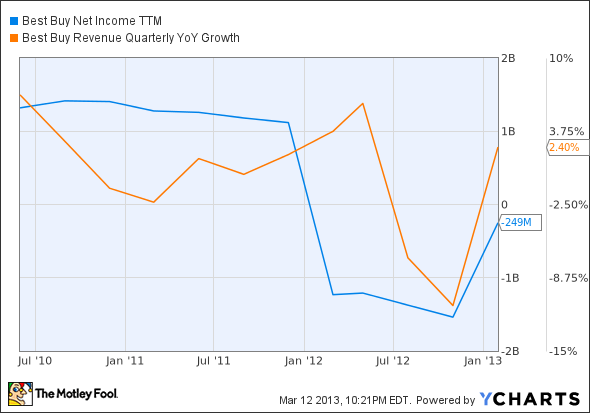 BBY Net Income TTM data by YCharts. New competitors to the electronics business, both online and at bricks-and-mortar locations, are taking sales that Best Buy could once count on. As a result, Best Buy has been on a mission to find ways to rejuvinate sales. Small-format stores that sell mobile products are popping up around the country and some of the larger versions are starting to disappear. But what if what Best Buy really needs is a shift in the electronics it's trying to sell us? Moving into (gasp) electric vehicles and solar is a move the company should seriously consider. Best Buy has gradually been moving into the service business for years. Go to the company's website and you can see services for home theaters, computers, car GPS, gaming, and many others. Geek Squad has become a do-it-all electronics arm for the company to sell electronics to consumers. If you're buying a large home theater system or need some computer help, this is a valuable servicem and it's one of the reasons Best Buy can compete with Amazon.com, Target, and Wal-Mart. But this may just be the start for Best Buy. The company recently announced a deal with Ford to provide electric charging station sales, installation, and support. Ford's dealers don't want to become on-call electricians who go to your home and install a car charger, so Best Buy does it. The service side of the business is already there, so it's a natural fit for Best Buy. This isn't the first step into electric vehicles by Best Buy, so thinking it will play a role in the EV future isn't a stretch. The company used to sell the Brammo Enertia electric bike and currently offers a number of electric car chargers. General Electric is one of the brands Best Buy offers, and when you think about it, this is probably the best retail avenue for the electric equipment giant. GE is building public charging stations, but where else does it get into the home? Home Depot? Independent dealers? Best Buy has the showroom to make it a less intimidating purchase for consumers and the electronics expertise to get it installed. Speaking of intimidating purchases, how intimidating is it to spend $20,000-plus on a solar system for your roof? Wouldn't you rather go into a showroom to compare panels and installation designs and even get a price quote than having to call someone to show up at your house? Best Buy could offer a full-service solar product with all of these features, just as Home Depot does with kitchens. Independent installers and solar manufacturers would love it if Best Buy got into solar, and they could help with the infrastructure. SunPower has its own leasing program, which could be folded into Best Buy's sales, giving a service the company doesn't offer. In my hypothetical scenario, SolarCity could even play a role by offering financing and being an installer in some locations. Or they could choose to be a competitor. It's not a stretch to see Best Buy make moves in electric vehicles or solar from a strategic standpoint, and the finances are there. The Department of Energy has backed off its goal of 1 million electric vehicles by 2015, but there will still probably be more than 1 million electric vehicles on the road by 2020. A charger goes for around $1,000, and when you throw in installation there's probably $2,000 or more in revenue per system for Best Buy. If the industry grows and Best Buy partners with more auto manufacturers, it's not unreasonable to see $1 billion in revenue annually by 2020. Solar has even more potential. California alone spent nearly $1 billion last year on residential solar systems, and the number of systems installed grew 54% to 40,000. Solar is growing nationwide, and if Best Buy captured even a fraction of the market, it would be huge for the company. As I mentioned, an average solar system costs around $20,000, and with the opportunity to sell to millions of homes, the revenue opportunity is huge. I'm not saying Best Buy is going to do either of these things overnight, but the pieces are there. The company is working with Ford on chargers, and Ford is working with SunPower to cross-sell solar panels. Best Buy sells electronics and is increasing service offerings for a variety of electronics. Why can't electric vehicles and solar panels be next? The battle between bricks-and-mortar and e-commerce wages on, with Best Buy caught in the middle. After what might have been its most tumultuous year in history, there are now even more unanswered questions about the future for the big-box electronics retailer. How will new leadership perform? Will old leadership take the company private? Will a smaller store format work out for both the company and its brave investors? Should you be one such brave investor? To help answer all these questions, The Motley Fool has released a new premium research report detailing the opportunities -- and the risks -- in store for Best Buy. Simply click here now to claim your comprehensive report today. The article Is the Future of Best Buy a New Generation of Electronics? originally appeared on Fool.com. Fool contributor Travis Hoium manages an account that owns shares of SunPower. He owns shares of SunPower, has options on SunPower, and is short Amazon.com. The Motley Fool recommends Amazon.com, Ford, and Home Depot and owns shares of Amazon.com, Ford, and General Electric. Try any of our Foolish newsletter services free for 30 days. We Fools don't all hold the same opinions, but we all believe that considering a diverse range of insights makes us better investors. The Motley Fool has a disclosure policy.